Well looks like our ocean is heating up as "Ahi Fever" is just around the corner and the boys are already hooking up! Rumor has it the auction block is full of tuna and prices are low if you are trying to sell fish so better just hook up, spear um, and eat um! Ken Pang and his crew on "Aloha Friday" landed this beauty and was kind enough to save us a few slabs of sashimi for our family. Winds are forecasted to back off a little more and surf on the south shore is on the rise so pick your hobby and get out there and stay cool! In Japan you have the popular "Tsukiji fishmarket", in Seattle you have famous "Pike Place", in Hawaii we have the newly renovated "Pier 38". KHNL News 8 had a big interview for the 2nd annual Hawaii Fishing Seafood Festival and our "Hawaii Skin Diver TV" host, Merlinda Garma and popular chef Nico were there to promote the event. The event is held the first Sunday of October and you will find booths representing the finest seafood restaurants, diving and fishing stores, and ocean enthusiast around the 50th state here. If you are in Hawaii, make plans to be there or visit Pier 38 daily where you can check out the catch of day, Nico's restaurant or Uncle's Fish Market for a great meal. Mexican Shootout 2008 in La Paz Mexico is coming July 21-26! At last year's event, a week after we left all the action of seeing and shooting marlin, Tim Hatler, host of Palapas Ventana landed this 277 lb. black marlin. Mexico offers all sorts of pelagics fish and July is the best time of the year. In addition to Marlin, you can find sailfish, mahi, ono, amberjacks, roosterfish, yellowfin, and groupers of all sorts of shapes and sizes. Tim and Karon Hatler are great hosts and they have the best boatmen in town working for them. We have some spots left so sign up before the airfares start skyrocketing! This could be YOU! Summer is here! Surf is supposedly on its way but so is the crowd. 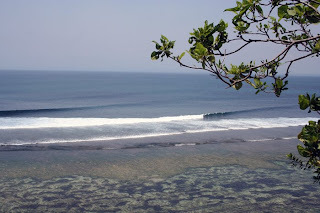 Every year we look forward to surfing uncrowded perfect peeling waves and Indonesia continues to deliver consistent waves all summer. If this was diamond head cliffs, there would be 500 surfers out in the water. Imagine arriving with your buddies at this lookout seeing this endless left hand wave peeling for miles with not one surfer out? Need I say more? Start bringing home lunch to work, save those pennies, and get a passport!